Only if the monument is on military property would the Corps or other military entity have jurisdiction. ... my contacts with people in that agency indicate that the USGS has no interest in or jurisdiction over these monuments. Thus I conclude that, generally, private owners or communities are the only ones that have control. Thanks! I'll look into who has control over this one; the monument is on Fort Douglas property, but the Fort has mostly now been turned over to civilian use and the decomissioned parts are, I believe, owned by the University of Utah. Good day, benchmark people, is this monument a loggable benchmark? As far as the preservation goes, this monument doesn't appear to be in lots of danger - though it is on a fairly heavily traveled bit of ground near some student housing. The material itself seems to be sturdier than the sandstone monuments. I don't know if any special preservative techniques have been applied to it. However, the University does seem to be preserving and restoring the original fort buildings, so the outlook is good. Here is one I bet could give some clues to difference in GPS and Astronomical if you could find the point. DESCRIBED BY COAST AND GEODETIC SURVEY 1886 (CH) STATION IS THE EAST PIER IN THE WEST ROOM OF BRICK AND STONE OBSERVATORY ESTABLISHED BY LIEUTENANT WHEELER IN 1873. IT IS ON RIDGE ABOVE THE WEST BANK OF THE WEBER RIVER, DIRECTLY OPPOSITE OGDEN, AND ABOUT 1-1/2 MILES FROM THE COURTHOUSE. RECOVERY NOTE BY COAST AND GEODETIC SURVEY 1958 (LFV) ACCORDING TO INFORMATION OBTAINED AT THE CITY ENGINEERS OFFICE THE BUILDING WAS TORN DOWN MANY YEARS AGO. If you could find even the remains of the building. I am not sure who you would talk to about preservation. Maybe the National Archives(National Register of Historic marks). Have you contacted the BLM. I just ran across this one doing the Google Earth Map. I also noticed that Wheeler's Astronomic Obs. are just SW and .22 to .25 miles from the present marks. Great that you have identified the monument that started this whole discussion! Here is some more info that is contained in Wheeler's table. The astronomical monument at Camp Douglas was installed in 1873. In the "Remarks" column it states: "By chaining; stone monument in same position as old flagstaff." 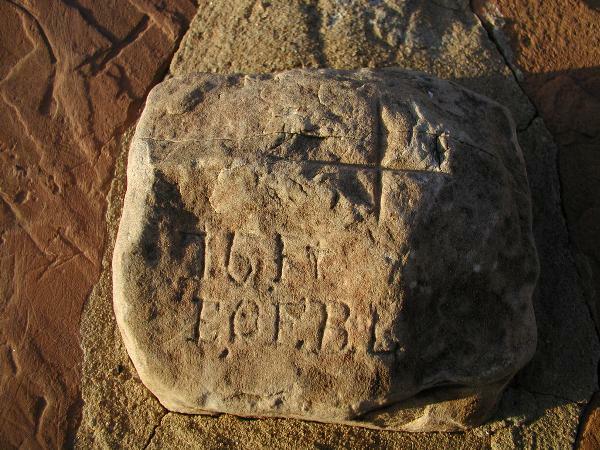 For the site described as "new flagstaff," the table states that it is was surveyed in 1877 and is "connected with astronomical station at old flagstaff and sundial." 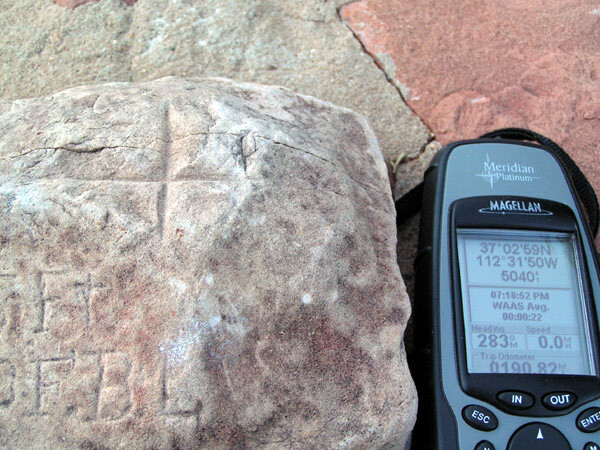 Remarks column: "By trigonometric connection with sundial and stone observing pier, established by survey." Hope this helps complete the picture. I would like information about the one in Beaver, Utah. There is a Flagstaff Astro Station listed in NGS, but no details, monumented in 1872. So, what does it say about the monument, could these be one and the same? This is one that is close enough for us to go and research it. Also, any info about the ones in Kanab and St. George would be nice because they are closer yet, just not any GC/NGS listing close that might be considered as one of these. If you can check the present flagpole and monument by compass (allowing for your current declination) and tape measure without getting arrested, and find good agreement it would be a strong piece of evidence that neither has moved. Heh, I don't think I'd be in any danger of being arrested. Being looked at funny by passing students, yes, but that would hardly be a first. Dozens of them walked past as I took the pictures at the beginning of this thread, and they spared barely a glance for the weird middle-aged guy taking snapshots of a rock. Embarrassingly enough, I don't own a compass nor know much about using one (like how to allow for a declination). I'm a total geo-newbie. I'll see what I can find out, though. So I think that means the compass points east of true north, and the 235 degrees true will be indicated on your compass as 222 degrees to the right of magnetic north. If the compass doesn't have a 360 degree scale, then it would be just a hair (3 degrees) south of magnetic southwest. The memory rule is "Declination East, Compass Least". I don't have to deal with declination for most things in my area, because it is currently under 1 degree. So if I have it backward, let us know! 1. Beaver, UT. "This station is situated in the main plaza of the town, a short distance east of the church, which is used by religious societies other than the Mormon, and between this building and the main street running from north to south" (p. 59). The observations were made in August 1872. 2. Kanab, UT. Monument installed in 1872. "Monument in square; front of Bishop's residence" (p. 490). 3. St. George, UT. Monument installed in 1871. No other location information. According to Wheeler's detailed map of Ogden and the observatory there, the observatory was located about 4,350 feet west of Wall Street at a latitude that is halfway between Fifth and Sixth Streets, and about 1,700 feet south of the bend in the UCRR railroad tracks. I will check with National Archives. Thanks for the suggestion. Not sure about BLM -- none of the Colorado monuments are located on BLM land. Ok, I'm game. I'll call dibs on the New Mexico stations. Could you post info on the Santa Fe (good call on the siting), Las Vegas and Cimarron stations? That's a two hour drive out to Cimarron, getting the other two along the way. I've been meaning to get up in that direction for a while. No need to do any research on the Ogden station, as the link Geo posted above gives accurate coordinates in the modern NAD83 system so you should be able to get within a few feet using a handheld GPS. I find this discussion very interesting and since this is near me I'd like to try to locate some sort of mark. If your book has any more info on this location please share. EDIT: Alright, I pulled up the coordinates (NAD27) in Utah TOPO! and found something marked "BR" in the general area. In my experience the standard benchmarks show up as a "BM" on these maps so could someone offer me some help in the BR designation. Is this the Wheeler mark or something totally different? How do you get KMZ files to link throough the forum? 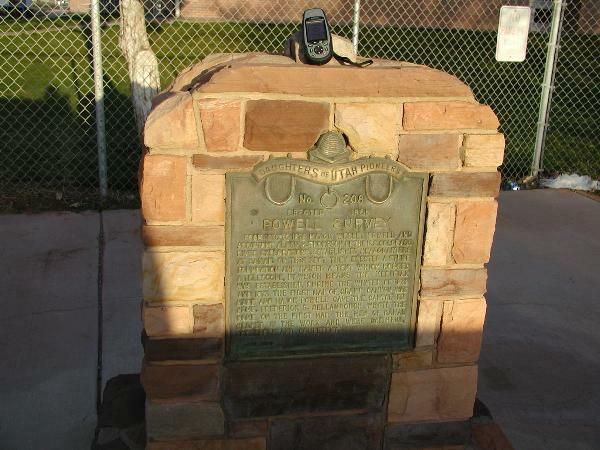 I've contacted a friend who lives in Cimarron, NM to search for the monument there. The coordinates given above for Cimarron are 36 30 10.01 lat, -104 54 59.04 long. Tom (tin-ear) sent an Image of the Skeleton Map from Wheeler. It is not that clear but have started adding the Forts that I know that are on the map. I also noticed it had Numbers for each place. I will try to get a better copy and update the file as I go along. You can to it just requires a small amount of html to edit and add to places. I finally figured out how to get the link in here. If you have Google Earth installed it should automatically open it up. The only additional info about the Richfield site is a cryptic statement in the Remarks column: "Camp at." -- presumably this means the monument is at the camp at Richfield? The monument was installed in 1873. Santa Fe: "The astronomical station is situated upon the military reservation, in that portion which is known as the old Fort Marcy parade-ground...The...position of the station is marked by a heavy stone pillar, about 4 feet high. On the mesa, 1,926.428 feet north of this monument, a stone meridian-mark is planted" (p. 341). The observations were made during June-July, 1873. Las Vegas: "The astronomic monument is in the center of the plaza, occupying a position which affords an open view to the east..." (p. 387). Observations were made July-August, 1874. Cimarron: "By permission of Mr. Morley, vice-president of the Maxwell Company, the astronomical monument was fixed in the corner of a lot in the southern part of town...The meridian is marked by two pillars of solid stone planted in the earth and extending three feet below and one and a half feet above the surface of the same. The center of the south meridian-mark is exactly in the meridian of the middle point between the two iron pieces which connect the platform and the foundation of the astronomical station; the center of the cross on the north mark is about 0".7 east of the meridian line" (p. 405). The observations were made in September, 1874. I am sure if you can find this picture point on Beaver you will find it. You think it still looks like this? Great research and interesting history.. Your GPS coordinates on some of them you've found would prove interesting. I did some NGS searches around a number of the points on your list and found a few that show up. What I was trying to do is see what shifts or differences there were between NAD83 and the astro positions given. This would help validate that there is no particular reason to suspect the monument has moved based on the coordinate. Is not inconsistent with the rough shifts and variations with other monuments and particularly in that area, i.e. Salt Lake shown right above it. And then the flagpole may also corroborate. I can provide Wheeler's lat-long figures for these, if anyone is interested. (I have a personal copy of Wheeler's v. II, 1877, Astronomy and Hypsometry, which I found in a second-hand book store in Seattle -- it's falling apart, but is still a great reference!) It's too bad that we don't seem to have any record of any monuments that wheeler might have installed during 1875-79. At the Denver Public Library I will double check his other volumes to see if I can find any reference to later monuments. On a lighter note, after writing about the inscription on the Georgetown monument and what Wheeler described in his volume as the standard inscription for his monuments, I had an inspiration that I had possibly misread the Georgetown inscription. Indeed, upon closer inspection today, it does not read "71 LOCATIONS WEST OF THE 100TH MERIDIAN," as I had thought, but rather it does read "EXPLORATIONS WEST..." The E (at the corner) is completely gone, the X I misread as a 7, the P as a 1, and the R as a C.
The "astronomic observer and computer" for many of Wheeler's sites is listed in his reports as "Dr. F. Kampf." I have been unable to find any biographical information about Dr. Kampf, nor even what his first name was. Presumably he had a PhD in astronomy. He worked for many years with Wheeler's teams in the field and each winter would return to Washington[?] to work up data. In Wheeler's v. I he is referred to as "the late Dr. Kampf." If anyone has any information about him, I would appreciate learning of it. Edit note: Wheeler's v. I is dated 1889. Now Kanab has a very unique History. When John Wesley Powell's crew of topographers, geologists, other scientists, artists, and photographers arrived in Kanab in 1871, the settlement was in its infancy. Only a few scattered houses stood outside the fort. Fruit trees, shade trees and vines were just getting a start. Yet the town was a haven for men who had just spent grueling weeks voyaging down the Green and Colorado rivers. Malnourished and exhausted, the men had a chance to recuperate and improve their diet in Kanab. Furthermore, the location was ideal for pursuing further geographic investigations of the Colorado Plateau. The town was Powell's field headquarters during 1871-73. 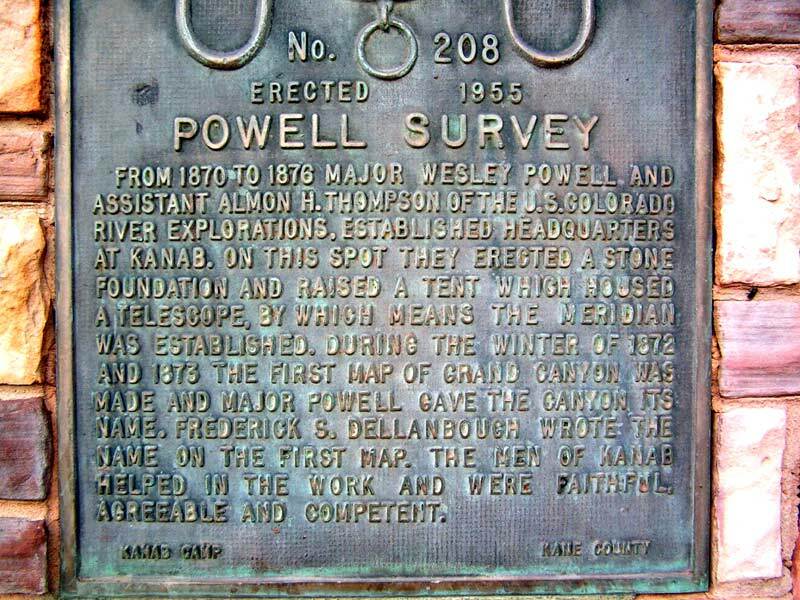 Powell's second expedition down the Green and Colorado in 1871 and his mapping and survey work during the next two years have been overshadowed by his dramatic first expedition in 1869. Yet, the later methodical investigations provided the scientific data so valuable in understanding the physical features of the Colorado Plateau. The headquarters in Kanab were extremely important to the field investigations and the production of maps and photographs. From this base camp the survey fanned out in all directions. Kanab supplied the survey crew with food, services, and employees. On the personal side, residents gave the men, far from home, friends, and family, the social interaction that brightened their days. Powell's brother-in-law and chief assistant, Almon Harris Thompson, set up the base camp a few miles south of Kanab (actually in Arizona) in the fall of 1871, following the major's directions. There the crew made short forays into the surrounding area, worked on their maps, and analyzed field data. In town they could buy butter, milk, cheese, molasses, meat, potatoes, and vegetables; pick up their mail and send letters; find blacksmiths and wood workers to make repairs, make posts for their survey flags and other necessary items, and shoe their horses and mules; and hire young men to herd their animals, freight supplies, and work as helpers during the survey. One of the best things the village offered that first winter was a social life. Dances were held often in the Kanab schoolhouse, and the members of Powell's crew attended. At first the Mormon girls were reluctant to interact with the men, but as time passed they accepted the surveyors and friendships developed. Captain Francis M. Bishop joined a debating group, and some of the crew took tea or dined with townspeople. During that first winter the men established a baseline that ran for nine miles south of Kanab and made triangulations and other measurements in preparation for more field work the following summer. Thompson, or the "Prof" as he was called, was in charge of this work. His wife, Ellen Powell Thompson (who collected botanical specimens), and her dog Fuzz lived in the camp, as did Major Powell, his wife Emma Dean, and their infant daughter for part of the winter. During the spring and summer of 1872 the crew traveled south to the Grand Canyon, east to the Paria River, west to the Beaver Dam Mountains, and north into the High Plateau country with Kanab as the center of operations. That fall they reestablished headquarters camp at Kanab, this time right in town. Major Powell had gone east on business, so the "Prof" was again in charge. He rented a town lot and set up tents with wooden floors. Two small tents were for storage. A large tent housed the men, and the Thompsons occupied another tent. In the center of the crew's tent was a long drafting table for map work. A conical iron stove kept them warm. The telescope and transit were set up on a stone foundation under a canopy that could be retracted for observations. A kitchen-dining tent was also set up. In addition to basic food items, the crew was also able to buy some Dixie wine in the area. The men entered into the town's social life as they had the year before. They visited friends around town and received visitors as well. They were part of the life of the community. Through the first part of December they continued their field work, branching out through the area. During the worst part of winter, they worked up their maps and expedition findings. The first preliminary map of the Grand Canyon was made in the tent in Kanab that winter. When it was finished in February 1873, a local tinsmith made the tube in which Frederick Dellenbaugh transported the map north to Salt Lake City for shipment east. While Powell's men lived in Kanab, the local citizens benefited greatly. Native Americans tanned buckskin for the crew. Local women were paid to sew the buckskin into coats, shirts, gloves, and breeches and to do other sewing, mending, or baking for the men. Thomas Robertson, the blacksmith, earned money for shoeing the horses and mules, setting tires, and mending wagons. Men from Kanab were essential to the field work of the scientists through 1872 and 1873. Many were employed as guides, packers, and survey helpers. The surveyors considered the Mormons to be excellent workers. One very important role of the Utah men was to transport supplies to the crews in the field during their frequent expeditions. As time went on, Powell turned more of his attention to studying the Native Americans and more of the geologic work fell to Thompson. Powell visited many local tribes, learning of their cultures and documenting them. While in the Kanab area he also had time to observe the irrigation practices of the Mormon settlers and noted their cooperative use of water resources. These observations were important to formulating his ideas on land and water use in arid regions. The years 1871 through 1873 were productive for Major John Wesley Powell, Almon Thompson, and the geologic survey of the Colorado Plateau. The little city of Kanab and its citizens played important roles in their success. The Wheeler survey was led by Lieutenant George Wheeler. The survey’s full title was United States Geographical Surveys West of the 100th Meridian. The survey covered a huge area over the period 1863-73, including California, Colorado, Montana, Idaho, Nebraska, Nevada, New Mexico, Utah and Wyoming. Wheeler produced the first contour maps of the region and developed the quadrangle system which the U.S. Geological Survey uses to this day. He also produced 27 land classification maps. Wheeler wanted to produce a uniform map of the western region. In his survey work he established careful measures of longitude and altitude. Jerry, great work collecting those shift values. I wanted to do that but have been distracted by other events and activities. The other part of that project would be to consider the deflection of the vertical and see if that would make the shifts more uniform. Is it just a matter of subtracting Xi and Eta or is it more complicated? I'm still not sure I know how to get the signs right. Someone stated that Wheeler's crew was well aware of deflection of the vertical, but how did they measure it and how closely? Are the astronomical numbers he provides supposedly corrected for that? Differences between those shifts at different stations (not just the shifts themselves) are two orders of magnitude more than the implied precision of the numbers on the stones. These were careful enough workers that they would have known if those decimals weren't significant. So our understanding is still incomplete. Geo, Here are a few pictures from the work of John W. Powell. 37° 02.985' & 112°31.834' WGS84 datum. This rock was the mark for the meridan they used to map the Grand Canyon region of the Colorado Plateau. Then the front of the monument. I don't know if the top stone was part of the monument and the plaque was added later, or if the stone was moved to where the plaque and monument are setting. Next time in Kanab, will check on it. And the last picture is the stone monument from 1871. It is about 9 miles or so south of Kanab. I believe this cairn was also part of the Powell survey. Remember that longitude in the western hemisphere is a negative number, so a negative Eta means that the geodetic longitude is east of the astronomic longitude. I looked at some of the datasheets that were matched with the Wheeler stations, and I have to wonder if they are really the same station. Some of the datasheets had monumentation dates of the 1890's, and I thought the Wheeler expedition was the 1870's. I've come across some CGS reports dating from the late 1800's and early 1900's, and they were confident by then that their surveys were accurate to within a few tens of yards. I agree that the discrepancies are not yet fully explained. Besides the Army engineers, the CGS also had several significant surveys of the region in the late 1800's. They would have had strong incentives to try to tie the various triangulation nets together, and may have placed additional monuments near some of the older ones, so the datasheets may not be for the Wheeler stones. Anonther line of investigation would be that the telegraphic time signals were from the coasts. I think the 1869 survey of the Salt Lake Meridian used Boston and San Francisco, so if we could determine how the longitude of the Boston observatory has been adjusted since the 1870's, that would give us one factor in the adjustment of the Utah stone longitudes. edit: corrected cos() factor in Xi, per Bill93, who noticed my original post had cos(longitude). Also changed the convention on Eta and Xi, which I originally took from Bomford's Geodesy (he used Eta for the N-S deviation). The DEFLECT99 uses Eta for the E-W deviation, and Xi for the N-S.
1845 - 71° 07' 55.35" - determined by exchange of chronometers with European cities. 1867 - 71° 07' 42.75" - based on the first exchange of telegraphic time signals with Europe. 1897 - 71° 07' 45.69" - an adjustment by CGS. 1983 - 71° 07' 42.03" - based on the NAD83 datum. It is easy to see how hard it was to determine longitude in absolute terms. Even though the observations had high precision, the accuracy was uncertain. All telegraphic longitude determinations, like Wheeler's and the others since the mid 1800's, were based on the longitude of the Harvard Observatory. edit: see http://www.lib.noaa.gov/edocs/BACHE2.htm for the history of those observations and other fascinating information. see http://docs.lib.noaa.gov/rescue/cgs/001_pdf/CSC-0016.PDF for a full report of the first telegraphic exchange of time signals and determination of longitude. For anyone else who is trying to learn this, I found a tutorial on astro to geodetic conversion. geodetic latitude of the point. corresponding geodetic longitude of the point. clockwise astronomic azimuth, to obtain a "near-geodetic" Laplace azimuth. opposite sign and is subtracted from astronomic azimuth. That is a difference of only 26 meters, and is probably accountable for by the imprecision of the GPSr and then different ellipsoid that Wheeler used to reduce his astronomical observations. FWIW I googled United States Geographical Surveys West of 100th Meridian and got this page which has an image of the original map. I also took a drive in the area where the Richfield monument is supposed to be yesterday. The area is pasture fields on private property. I scanned the fields with binoclulars from the road, but could not spot anything. If we can get updated GPS coordinates to narrow-down the area maybe I can get permission to do a more detailed search. Keep all the good knowledge-building info coming! EDIT: Using the DEFLEC99 program and the formula's given on the link I have recomputed the Richfield coordinates as N38 46' 11.04", W112 02' 30.33" - I will try to get back out and see what I can find. The David Rumsey Map Collection has 120 maps with G.M. Wheeler as the author. I particularly like the 1873 Skeleton Map showing what areas had been surveyed and astronomic monuments had already been set in 1869, 1871, and 1872, and what additional area were to be surveyed in 1873 and where additional astronomic monuments were to be established. I've been following this thread with great interest, even though I didn't see mention of any areas west of NM. BUT - I linked to the map in the above thread, then ended up HERE, and searched the David Rumsey Collection by "1878 Progress", and got 5 maps of Wheeler expedition on thru 1882, and they included Southern California. NOW I'm even more interested! Also, run a search from the ame place on "Wheeler". 120 maps! ColoBill: Any data in your book on the southern half (or so) of California? The maps mentioneded above show some surveys running thru San Bernardino, Santa Ana, Los Angeles, Santa Barbara etc. Old stuff hard to keep preserved out here in the land of 10 lane freeways, but I might get lucky...... Thanks. West of Salt Lake City is the Great Hexagon with WHEELER PEAK at its center connecting the stations on the Wasatch Mountains to the east with those about 200 miles to the west in Nevada. Due to the remoteness of the area and short working season it took 10 years to complete the observations at the 7 stations involved. Has anyone figured out yet which 7 stations these are? I have been trying to figure out the hexagon. tosborn, I'll leave off Cimarron, as it's an extra hour each way. I'll try for Las Vegas and Santa Fe, and see what your friend says. I came up with those after reading through the CGS Reports for 1878 through 1897. We went to Beaver, Utah yesterday and could not find anything that looked like it might be a meridian monument. We even search for JO0509 Beaver Flagstaff Astro Sta. It has adjusted coordinates, but the only thing found was a drinking fountain. We adjusted the GPSr for datum & DD MM SS. One adjustment had us in front of a house and we thought we found the monument, but it turned out to be a stone & concrete fence post that had been over-turned. We did stop in Kanab and got a better picture of the monument there. The rock on top of the monument has a cross cut in it and the line aligns north/south. Here is a readable picture of the monument and it says it is on the exact spot where the tent & telescope were set-up. Here is a better picture showing the rock and our GPSr set to DD MM SS, NAD83. Holo,John and the rest of ya. It is really getting to be fun learning all this neat new stuff. Did anyone ever think that we would be having this kind of camaraderie. I remember at the time when I found the first Wheeler Stone in Ft Bayard that I had stumbled across a unique piece of history. I never figured it would become this talked about. I finally got the Insight thingy working on the Rumsey map collection. (If you download the Java), you will need to open it back up through the same link you downloaded from. It took me forever to figure that out. The viewer is awesome once working. I am also updating that WHEELER KMZ file and will make it a KML which will open in a GPS program. Anyway back to work on it. Almost all of Wheeler's topo maps were illustrated by hachures, not contours. He did make at least one contour map, but this type was more expensive to make than using the hachure technique. Also, for his military purposes apparently the hachure approach was sufficient. According to Dawdy, the civilian-led surveys took the lead in the production of contour maps and in perfecting mensuration techniques in general. I suppose you could say that Wheeler's quadrangle system was a precursor of the quadrangle system that the USGS later adopted. Wheeler laid out 95 quadrangles covering all of the U.S. west of the 100th meridian. These were 2 deg. 45 min. in longitude by 1 deg. 40 min. in latitude and were subdivided into fourths. For example, I have a copy of his topo map of Central Colorado, which covers the NW fourth of quadrangle no. 62, i.e., no. 62(A). Would the INITIAL POINT be listed? I looked and the quad numbered 1 is in Nevada. I wish I had all the tools to find this stuff fast. I was also wondering(researching size) about the info you posted that's great info. I'm not sure what you mean by "Would the INITIAL POINT be listed?" By the way, I'm new at this and haven't yet figured out how to quote only a part of a post. Maybe somebody can help me out. OK 1st I mean what was his A1 station or starting point for laying out the grids. I presume it is the Wheeler Peak. As it is the center of the quad but that is only a guess. Then scroll down and copy and past the portion of the text you want in your post. Then highlight it (like copy) but then hit the little quote box or blue envelope looking thing in the top where links,images,fonts ect are. This is in reply to post #81, the inquiry about whether there is any California listing in Wheeler's book. The only CA listing in the table of "Geographic Positions" is Camp Independence, 1871, at 118 12 45.00 and 30 50 10.00. In the remarks column it reads, "Longitude by lunar culmination. Zenith-telescope out of order." From my atlas, I conclude this is near or at the modern town of Independence, in the Owens Valley, below the Inyo Mountains. Thanks, Bill! Was up there last year. Maybe again this year! Either a Wheeler typo or a ColoBill typo. This time it was a "ColoBill typo." Thanks for catching that. Yes, it should be 36 degrees. went with explorers and conquistadors. measurements, to allow their incorporation into the scientific literature. telescope from its pier and used the observatory as a shelter for the homeless. forced the closure of the observatory. If I studied this correcty this would be His Initial Point or Point of Origin of start. I am working up the list now. You have a bunch of really old marks in California. What a great thread! I wish I'd found it sooner. I found the Wheeler Stone in Austin, Nevada in February 2005. I had no idea about the history behind Wheeler's surveys, though I knew that Wheeler Peak on the eastern edge of Nevada is named for him. Even before finding about some of the history behind these, I considered this find to be one of my best. I have little doubt that the highest point in San Francisco, Mount Davidson was named after the same Davidson. Been up there a couple times, but way before geocaching or benchmarking existed. Those "Wheeler" maps linked above show some of Wheeler's survey parties going through Southern CA. I'm planning to research those, if I can. They are lots closer. Well to save you a lost of searching. I can't keep those marks a secret for long. There are a bunch of them that are listsed as NGS benchmarks now. And no one has found them yet. Starting with his work in 1851 Point Conception (Concept Point)and forward. I am adding them to the GOOGLE EARTH KML (KMZ)file and have been working quite feverishly trying to get it done. It is an amazing history. If you get to them first Let me have some of the credit for pointing them all out. I do not think I will get out to California fast enough now. Now I guess you wanted that list of marks. Use the Name function to search. There are a few I can't find yet but most are there. Use Point instead of Pt.etc. Thanks again, GEO! Nice source data, and references for more than I could find / read in months! I look forward to seeing your kmz file. Google Earth is very useful. Well, I knew I'd seen more than a couple of these. The Use Astro Pier is the Meridian Stone near Julesberg, Colorado.